Game Informer exclusively reveals one of the biggest games on the WiiU for 2016. Earthbound Forever is a remake of the classic MOTHER trilogy (Including the long awaited MOTHER 3; now renamed Earthbound II) and does more than add a new coat of paint. We also talk to the series creator Shigesato Itoi on his final project. In other news, we take a look at Batman: Arkham Knight’s PS4 exclusive DLC as well as a new character for Mortal Kombat X that is sure to please long time fans. If this is true, it will bring joy to many fans since the last Mother game, Mother 3, was released in 2006 as a Japanese exclusive. 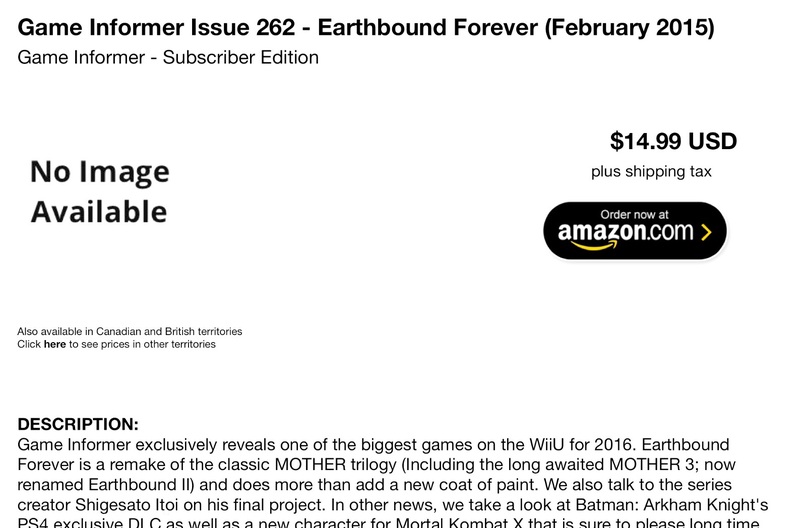 Though bear in mind that Earthbound (Mother 2) was already rereleased on the Wii U’s Virtual Console service last year for Europe and North America, so this information has a higher possibility of being incorrect. Though, this does come as a funny twist of fate right after Square Enix’s announcement to port Final Fantasy 7 to the PS4. Right now, the only way to know if this is true is to see what happens come February. This article was filed under Articles, Gaming News, Nintendo News.